My open water swim training went very well indeed! I was told that for the past 20yrs I have been swimming with half a full swim stoke, so with some advice and guidance from Andy, I was soon gliding and travelling further with every pull – an impressive nd pleasing result from an hour in the water with the Maestro! Andy also suggested closing my hand a little more, and pulling down whilst in the stroke, so many thanks to him for some great advice. 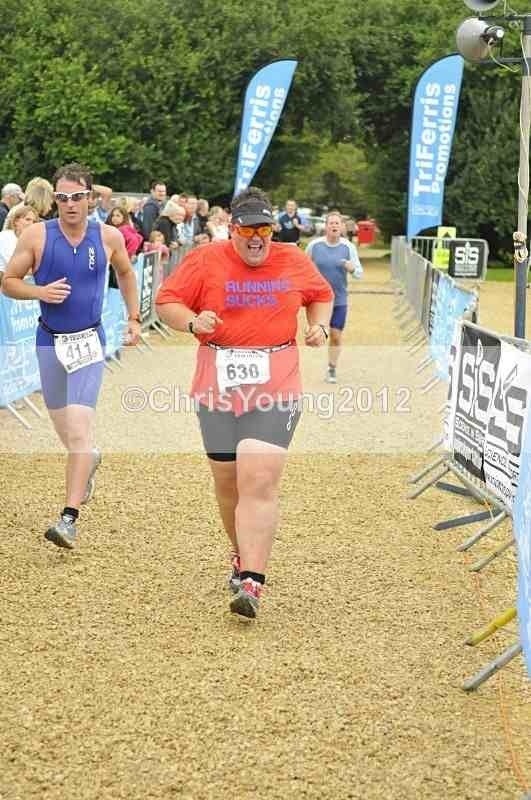 At the weekend I completed my 2nd triathlon of 2012 and am proud of my achievement. It was a 400m open water swim, mass start. I was out of my ideal positin and didn’t think this would be an issue until I got a few kicks in the face, drank some lake water, paddled around a bit to get my senses and breathing back and took my time. It was frustrating as the slower swimmers slowed my pace and made my life more difficult than I w making it for myself. I was also in a pack and found it hard to move away into my own space. This as a lesson in what to do and what not to do, so lessons have been learnt. Next to the bike! For the past few weeks I have been off the road after seeing a local rider badly hurt on the road. I stopped to help the guy and saw his injuries close up and at first hand – truly gruesome and out me off my bike for a while. I have been on my bike on a turbo, turning the pedals and sweating a lot, hitting and exceeding the triathlon distance. Getting onto the bike on Saturday I was nervous, but felt good after the swim and knew I was in a good place for the 20km cycle. I cained the bike leg in 39mins, 17seconds, averaging 81 revs a min on the pedals, with a max of 101, so almost the perfect leg for me at this time in my triathlon career. The run was painful, hard work and I was pretty tired after the bike which was my big focus for the day, it took me 19mins and I was dead on my feet (3.5km). I hate running as I am just too big for it, but I did enjoy the finish line. Overall time was 1hr, 14mins and 47 seconds……….I beat my personal trainer by close to 2 mins! 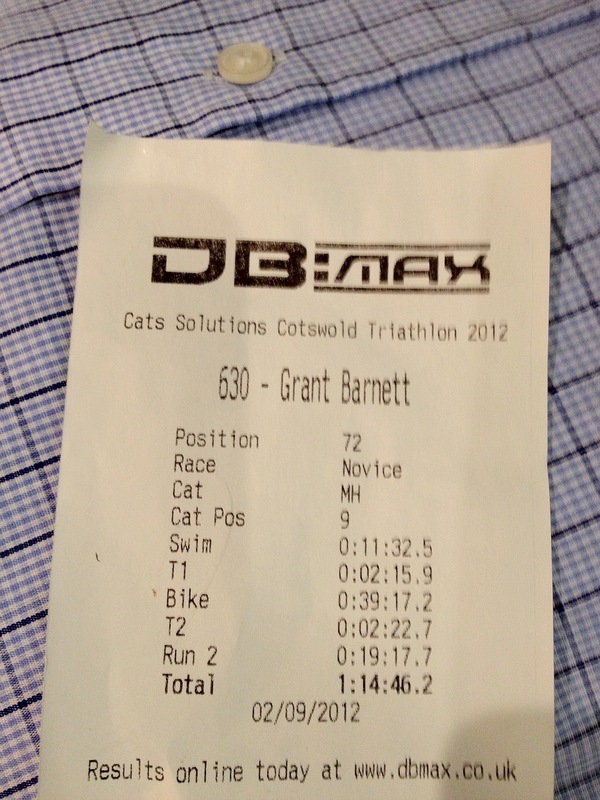 His bike time was 34 seconds quicker than mine………it was a long, tough day, but fantastic. Jeremy my PT enjoyed himself and I think we will do other events next year ! I learnt that I love open water swimming on the lake! I’m not keen on drinking the water! Gettung kicked in the face as an adult, unexpectedly, whilst in cold, murky water isn’t the most pleasant thing to happen to a person at 0842hrs on a Sunday, but neither is it the worst! Swimming with a full length arm stroke really helps. I am keen to drop more weight so I can run further, faster and more efficiently….I am determined to sort this out. Many more triathlons to come!? 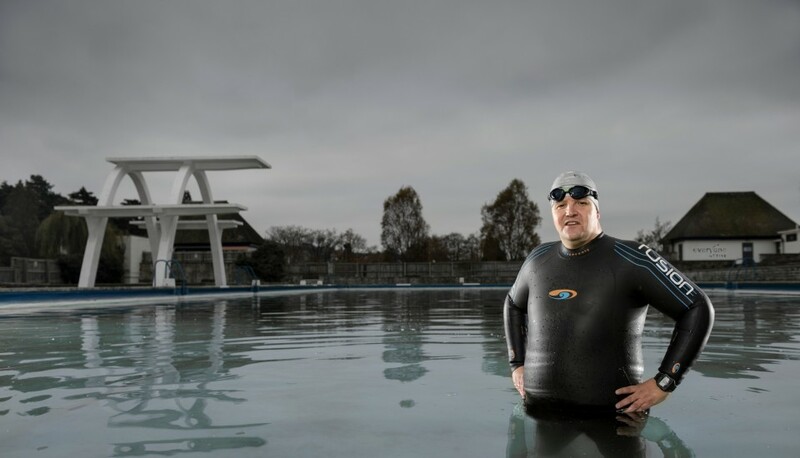 I really want to train for a 113 / Half Ironman, which is a year away…..I reckon if I could crack the run, work on the swim, loose more weight this could be feasible…..a long shot, a pipe dream, but somehow, in my mad mind, almost possible! ……….forever positive and currently still on my ‘Tri-High’ ! !